I love baked stuffed zucchini. It's full of comforting vitamins and vegetables that melt in your mouth after cooking in the sauce. The stuffing can be without without meat also! It's totally a preference if you want to stuff squash with or without meat. I like it with lamb,ground round or loose Italian sausage. You can leave the meat out for a totally vegetarian dish. Just use the zucchini that was hollowed out and rice in the stuffing. When I was growing up my mom would make this often. We loved it. We had relatives that grew kusa on their farm and would be able to use that hybred version of squash. Here in Florida they call it Mexican squash. It's light green in color. The taste is quite the same but so tender and seems to have less seeds in my opinion. Baking these is such an easy way to prepare this meal. I love using throw away pans also. I love making something with no clean up! The best thing about this recipe is leftover heat up easily and they taste great! 8 large or 10 small assorted colored zucchini dark green, yellow or green squash ... if your lucky enough to cultivate Kusa's from seeds those are the best of both squash to use! Mix rice, lamb, 1 tablespoon of tomato paste and all spices except fresh garlic together in a medium size bowl. Set aside in the refrigerator. In the meantime, slice zucchini in halves this usually makes sixteen halves. Scoop out all the insides with a spoon and put aside for another treat Zucchini Coconut Bread. Mix rice, lamb, 1 tablespoon of tomato paste and all spices except fresh garlic together in a medium size bowl. Set aside in the refrigerator. Scoop out all the insides with a spoon and put aside for another treat Zucchini Coconut Bread. Take the lamb mixture and press tightly into hollowed out zucchini. Pour into a dutch oven saucepan 1 cup of burgundy wine, tomatoes and rest of paste. Place zucchini on top and stack . Add water to cover half way up the pan. Add garlic cloves in the tomato-water mixture, 1 fresh basil leaf and salt, pepper to taste. Place in a dutch oven pan that has a tight fitting lid in the oven at 350 degrees until the rice and zucchini is tender takes around an hour and half to cook. Once the fork goes through the squash it's done. You can do this on top of the stove also. I like to make mine, it seems to control the heat better. Mmmm...love that...all in one pot. Looks very delicious. Oh, I love stuffed zucchini! I used to wing a recipe when I was single...and you've reminded me of how much I loved this! This was the first year we planted zucchini but not a single one has grown. Lots of blossoms though. Might have to give this a try. 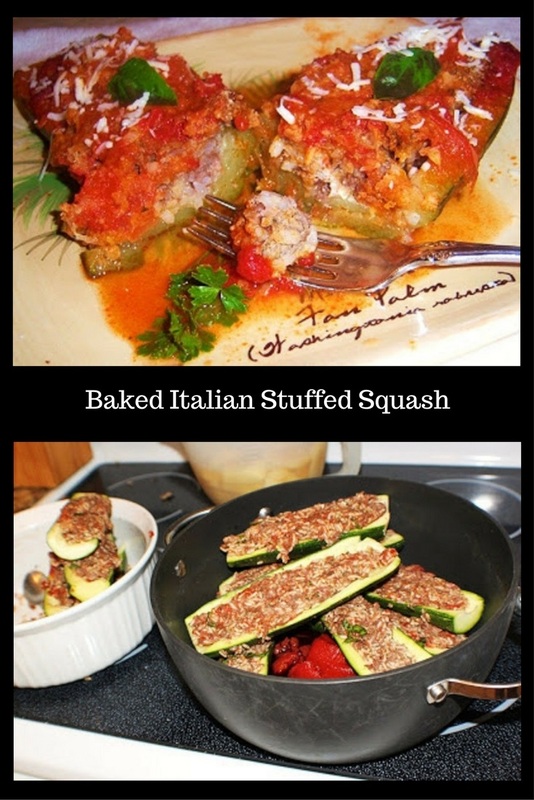 This would be a lot easier if one made the stuffed zucchini and the rice separately - and it would taste just as good. Sounds great! I never liked my Czech heritage when it came to food - stuffed cabbage has never been appetizing! (I love being Czech just not so much the stuffed cabbage part.) But my smidge of an Italian food heritage - yes please! All in a Dutch Oven - fabulous! I love all the herbs used - it truly makes it summer. And yet it's hearty enough for a meal. this looks delicious! thank you for sharing this. i know my husband would love this! Sounds very appetizing. A great mix of ingredients. YUMMY! I am not a zucchini fan but do you think this would work with eggplant?? This is yet another of your meals that I must try. It just sounds so freakin' good! Excellent, Claudia! The flavors have to be awesome! Like your flag too! Super delicious with lamb and all the spices and herbs! This is a good one for sure. I am loving all of the zucchini recipes I have been seeing this week. This is really a fantastic way to get a lot of this summer squash. This is the first time I've seen burgandy wine called for. My mom uses it all the time in her cooking. I was looking for a new use for zucchini, getting tired of my same ole, same ole. Hope you have a great weekend. nice! another use for zucchini!! love it! This is a great post. 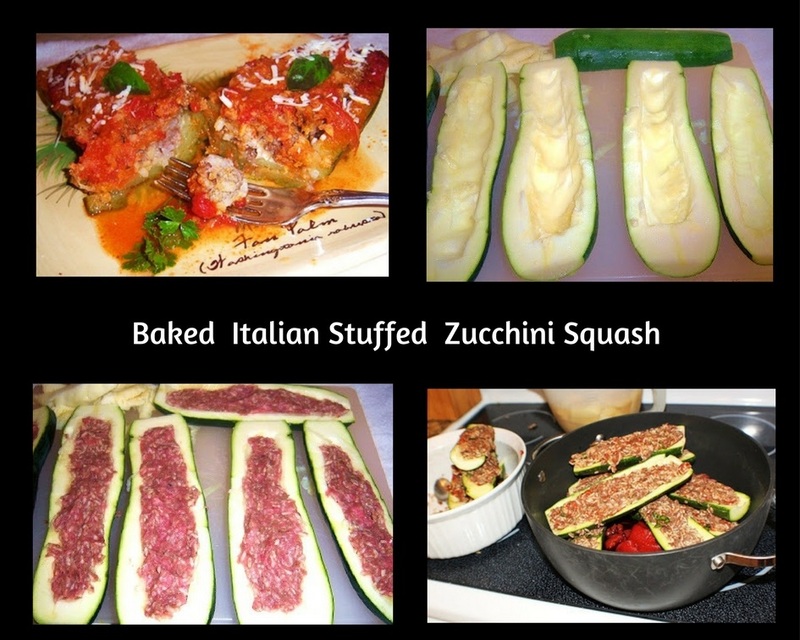 I needed a step by step how to make stuffed zucchini. Perfect for this time of year when there is SO much extra zucchini in the garden! Looked at all your zucchini recipes they look great. Will have to try some of them, lots of zucchini still available here in Central Fl. Have a great weekend. Never considered stuffing zucchini before, but why not! Looks wonderful! Love making zucchini boats. Great recipe by the way! I love zucchini, I use it all the time, I've just NEVER stuffed them before. What a great way to serve it! I have never cooked with lamb before but this sounds so good. I love your zucchini boats! Ooh, this looks good. I'm doing a similar kind of dish with eggplant tonight.